After Microsoft announced the (not so sudden) death of Kinect, LightBuzz has committed ourselves to providing viable alternatives for our customers and their businesses. LightBuzz has been developing motion-analysis applications for the past seven years, so we know first-hand how demanding such projects are. During the past few years, LightBuzz has helped numerous companies embrace motion technology in their business. 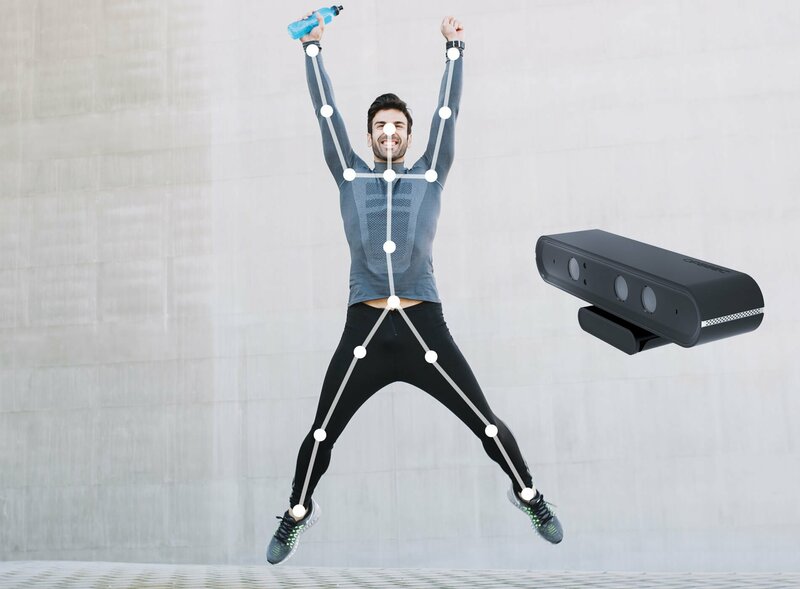 In case you are planning to migrate your existing Kinect project or just need to create a motion-analysis product from scratch, feel free to start a project with LightBuzz. So, let’s meet Orbbec Astra and Nuitrack! Orbbec Astra is a tiny yet powerful depth camera. It comes with a 1280×960 RGB color camera and a 640×480 depth camera. It weighs just 300 grams (0.6 pounds). More important, the camera only needs a USB 2 port. No separate power supply is required. Forget about that bulky Kinect adapter and its USB 3 limitations. Orbbec Astra is as portable as your laptop. Let’s now meet the software we’ll be using to detect and track the human body joints. ColorSensor Provides access to the raw RGB color data. DepthSensor Provides access to the raw depth data. UserTracker Determines the depth points that belong to the tracked players. SkeletonTracker Provides access to the 3D and 2D coordinates of the human body joints. Nuitrack is compatible with desktop computers and mobile devices. I’ll talk more about its mobile capabilities in my next article. Before diving into the development work, you first need to install the proper software packages on your Windows computer. Start by downloading the official Orbbec Astra drivers. The download link can be found on Orbbec’s website. If you miss this step, your camera will not function properly. Now that the camera drivers are installed, it’s time to download Nuitrack from its official website. Go to the Nuitrack Downloads page and select either nuitrack-win32.zip or nuitrack-win64.zip. In my case, I am running a 64-bit machine, so I selected the latter option. To develop motion-tracking apps using Nuitrack, you’ll also need to download the Nuitrack SDK. The SDK can be stored in a separate folder. Nuitrack is a paid package, however, you can try it for free for as long as you like. The trial version has a 3-minute time limit. Upon reaching the 3-minute limit, you’ll need to restart the app. Nuitrack supports a variety of cameras, but, for now, we’ll be focusing on Orbbec Astra. We are almost done… Nuitrack will be referenced from your projects using the path we specified back in step #2. The path should be stored in two environment variables. Hit the Start button and search for “Environment Variables”. The System Properties window should open. Click the “Environment Variables” button and navigate to the System variables panel. If everything was done correctly, you should be able to run one of the Nuitrack samples. Connect the Orbbec Astra to a USB port and navigate to the Nuitrack installation folder. Open the “bin” directory (e.g. “C:\Users\Vangos\Desktop\Nuitrack\nuitrack\bin”). Then, double-click the nuitrack_c11_sample.exe to test the camera. If you see something like this, congratulations! Your camera and SDK are working properly! Let’s get to the good parts now. We’ll develop our first body-tracking application using Nuitrack and Unity3D. I assume you have already downloaded the Nuitrack SDK. Unity will then prompt you to import the package. You only need the contents of the Nuitrack and Plugins folder, but you may import everything, so you can experiment with the built-in demos. A Canvas element; this will contain the user interface of the application. A RawImage element; this will display a visualization of the depth stream. 17 RawImage elements; each one corresponds to a human joint. To access the depth and skeletal information, you need to create a DepthSensor and a SkeletonTracker object. The DepthSensor object will give us access to the raw depth stream. The raw depth stream is an array of distance values. The SkeletonTracker object will let us access a high-level representation of the body data. Last but not least, call the Run() method. To display the depth stream, we need a reference to the RawImage component. We also need a Texture2D object that will be updated whenever we have a new frame available. The raw frame data will be stored into a simple byte array. To check whether the current frame is new, we’ll hold a reference to its timestamp. You can experiment with the byte array to create a visualization of a different color. I have chosen to create a shade of blue visualization. The MaxDepth value is the maximum depth allowed (aka 8000 millimeters; aka 8 meters; aka 26 feet). All of the depth values are measured in millimeters. One millimeter is approximately 0.039 inches. Nuitrack is using the metric system. As of now, our application can show the depth visualization, but it cannot detect any people. Let’s go to the event handler of the SkeletonTracker. The following code snippet shows how you can acquire the 3D and 2D coordinates of the tracked bodies. Keep in mind that Nuitrack can track up to 6 people. The 3D coordinates (X, Y, Z) are measured in millimeters. The 2D coordinates (X, Y) are measured in pixels within the bounds of the 640×480 depth frame. During the past few years, LightBuzz has helped numerous companies embrace motion technology in their business. In case you are planning to migrate your existing Kinect project or just need to create a motion-analysis product from scratch, feel free to start a project with me. Here are a few comments regarding common failures. Ensure you have installed the camera drivers from the manufacturer’s website. Also, check the nuitrack_c11_sample.exe file to ensure Nuitrack is installed properly. The Nuitrack trial has a 3-minute limit. This means you can test your body-tracking apps for no longer than 3 minutes. An app using the trial version of Nuitrack will automatically crash after 3 minutes of activity. To distribute your app, you need to purchase the commercial version. The ModuleNotInitialized exception usually means that no depth camera is connected to the computer. In case your camera is connected, it means there was a problem with the installation of Nuitrack or the drivers. Unplug the camera, re-install the drivers, and plug the camera again. So, did you like the Orbbec Astra camera? Did you enjoy the Nuitrack SDK? Let me know in the comments below! I have a question about Nuitrack SDK. Can Nuitrack SDK recognize voice? I want to apply Realsense D415 for Vitruvius. But I don’t know how to apply camera Realsense D415. I do the same thing as the DepthSensor, but the ColorSensor not works, after Nuitrack.Update(); colorFrame is never update, depthFrame yes. What is different to initialise with ColorSensor ? 1) Navigate to your Nuitrack installation folder (e.g. C:\Program Files\Nuitrack\nuitrack\data). 2) Open the nuitrack.config file using a text editor. 4) Change the CameraID value to 0, 1, 2, or 3. What step did I miss I wonder. Hi Mykel. Ensure you have installed the drivers of your camera and that you have also set the Nuitrack Environment Variables correctly.